My feet were on an upper rung of a wooden ladder, my arms in the high branches of a cherry tree. The day was not so much warm as infernally hot. I wore a harness attached to a cherry picking bucket to leave both hands free. I’d climbed the ladder as high as I dared, but clusters of cherries still hung just beyond my reach. I stepped down and wrestled with the ladder, a wooden, tripod-style fruit picker that my husband and I’d found behind the garage the winter before, just after we’d bought the property. I dragged its spindly front leg over a patch of rough ground, repositioned it closer to the tree trunk, and rattled it to check that it was balanced. Then I clambered back up. Craning my neck, I stretched my arm through the cluster of leaves above my head to reach a handful of what appeared from below to be perfect cherries. My fingers plunged into something sticky. 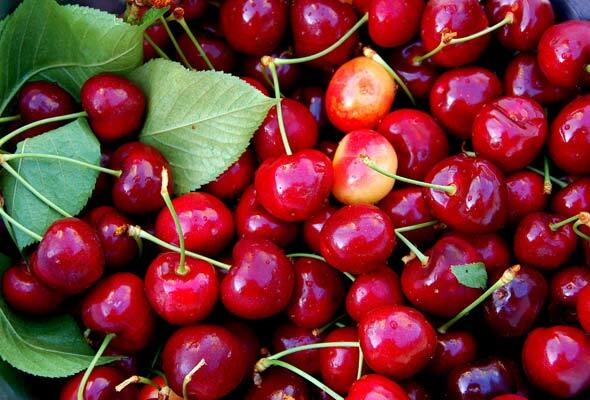 The largest and sweetest of the cherries had been pecked by robins, leaving the sides pocked with gooey craters. I leaned back against a sturdy limb and examined my hands, now stained purple. In half a morning, I’d harvested only the very easiest to reach cherries from one of our two trees. In my mind, I was in my kitchen, edging a pie-serving knife under a slice of custardy cherry clafouti. For a minute I forgot the aching in my neck, forgot the heat, forgot the twigs tickling my ear. Then our Border Collie wandered up from the vineyard and sprawled out on the grass beneath the tree. I shifted the cherry pail onto my hip, eased myself off the ladder, and squatted down to share the patch of shade as I popped a few velvety sweet cherries from the pail into my mouth. Preheat oven to 425 degrees. Butter a cast-iron skillet. Stages of my life tend to float back to me, inextricably intertwined with ingredients and aromas. Show me the cover of Diet for a Small Planet and I catch a whiff of burlap, oregano, and peanuts. Mention The Vegetarian Epicure and I hear the creak of plank floors at Community Natural Foods, the only place in 1970s Calgary, Alberta, where I could find wheat berries for honey bread and raw wheat germ for granola. Flip open a glossy magazine to a platter of nasi goreng—fried rice, made Indonesia-style—and I taste the clove-scented air of the open-air market in Borneo that I frequented in the early ‘80s. Ricotta cheese? I’m back in Athens, Greece, circa 1985, where my neighborhood grocer carved wedges of heartbreakingly supple slices of ricotta from mounds the size of flower pots. Unlike the granola and nasi goreng, which I actually made, that cherry clafouti was still a flight of fancy. I’d stumbled across the recipe in Saveur in the late ‘90s. Though I hadn’t yet made it, I’d become rather fond of the idea of it. That clafouti recipe represented a life that was so simple, so carefree as to just stroll into the kitchen and throw together dessert from what’s on hand. Blend the vanilla, eggs, sugar, milk, salt, and flour until smooth. My husband and I had purchased the vineyard in British Columbia’s Okanagan Valley in 2002. We were initially preoccupied with grapes. It wasn’t until that first Easter, when honey bees were zooming around the cherry blossoms, that we’d stopped to consider the two flowering trees outside our back door, and what the heck we’d do with the imminent onslaught of fruit. The trees, a Bing and a Van, were older varieties that had fallen out of favor when growers switched to Sweethearts, Lapins, and Staccatos. Unlike the trees in newer, high-density orchards, which were compact and slim, ours stood 20 feet high with thick trunks and limbs you could climb. We’d been told to expect 1,000 pounds of cherries. I’d wondered how many bowls of cherries we’d get from half a ton. We decided we’d eat some, share some with the neighbors, and sell the rest. I remember calling the owner of a local cherry operation to see if he’d buy a small crop. “How many do you have?” he asked. Come July of that maiden cherry season, when the fruit was purple and juicy, I’d lined up a deal with the owner of a nearby packing house to take whatever we could deliver, freshly picked, stems still attached. I’d set aside a morning and gotten an early start on picking. Two days later, I was in that tree, still picking, as was everyone else in the valley. Baskets of cherries made their way around the neighborhood in exchange for house sitting services, borrowed tools, fertilizer, seed garlic, fresh eggs. Truckload after truckload of cherries wheeled their way down the highway. Transient pickers—kids from Québec with dreadlocks and pet dogs—hitchhiked through the valley and pitched tents among the trees. Pour batter into skillet. Distribute cherries on top. That afternoon, I poured the silken batter into a skillet, scattered a handful of the hundreds of pounds of cherries I’d just picked over the top, and slid it into the hot oven. The cherries I’d sacrificed to the recipe made no discernible dent in my supply. A half-dozen baskets, heaped with cherries, still covered the floor. I hadn’t bothered to remove the pits from the cherries. According to the recipe, they’d add flavor. Most of my cherries, though, were destined for pie filling and jam. So I washed, I sorted, I stemmed, and then I fastened the cherry pitter to a cutting board straddling the sink. The instructions that came with the device showed cherries rolling off a hopper and happily falling into position under a spring-loaded rod that you drove through the fruit, which then flipped into a bowl while the pits dropped into a plastic cup. When it worked, it worked well. But if the cherries were too small, they jammed below the rod. If too large, the rod bypassed the pit. Either way, with every slam of the pitter, purple juice shot across the counter and onto my once-white wall. When the jammy aroma of baked cherries filled the kitchen, I opened the oven to check the clafouti. It billowed from the skillet like a cloud. I set it on the counter beside the open window and stepped back to admire its golden surface studded with splashes of purple. Just then I noticed a neighbor who’d borrowed our mower ambling along our driveway, carrying a plastic bin. I wiped my hands on a kitchen towel and went out to meet him. “Thought you might enjoy some Lapins,” he said, lowering the bin onto the patio. The bin must have held at least 20 pounds of cherries. I watched him drive away and wandered back to the house where I caught sight of myself in a mirror. My tee shirt was shot with cherry juice, my glasses were speckled, and streaks of purple painted my face. Dust with confectioners’ sugar, if you like. Cherry photo © 2008 Babi_Santander. All rights reserved.